Chinks are half-length chaps that stop two to four inches (5 to 10 cm) below the knee, with very long fringe at the bottom and along the sides. They are usually fringed along the outside edge and bottom, making their apparent length appear about 4 inches (10 cm) longer. The leg shape is cut somewhere between batwings and shotguns, and each leg usually has only two fasteners, high on the thigh. They are cooler to wear and hence a design that is suitable for very warm climates. Hickman Saddlery Chinks are custom made with hand tooled top and side panels basket stamped. Chinks w/studs and longhorn conchos. 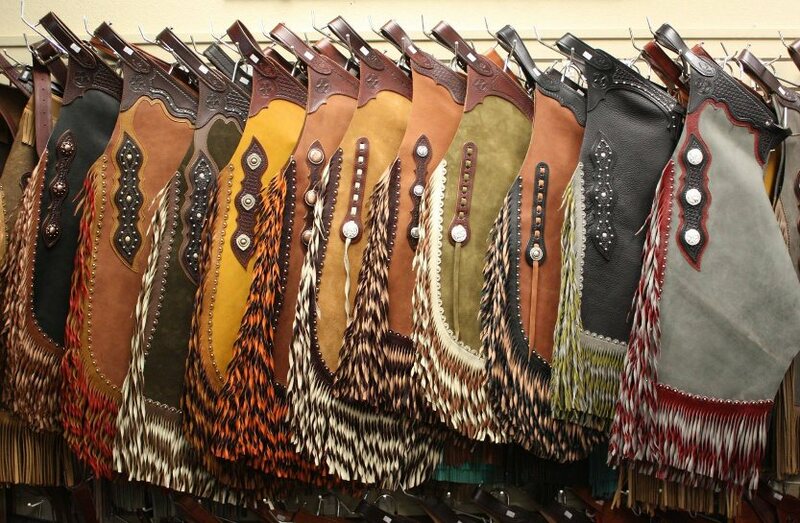 Dark brown chinks,saddle brown colour�fringe with silver spots. Black colour with silver spots on light colour fringe.